This past weekend I ran the Salem Distance Run 10K. This was my fourth time running this race. I was hopeful I'd have a good race, having run a time I was happy with in my July race, and having gotten up so early to run at the track all month. I knew I wouldn't run a PR (personal record) for this race (around 48:40 or so) but I knew it also wouldn't be a PW (personal worst - around 57:09 or so). When I walked outside to the car I knew as soon as I inhaled the early morning air that I was in trouble. See, I have this little thing called asthma. I've had it as long as I can remember, but I tend to forget I have it because it doesn't bother me much anymore (at least, not like it did when I was little). But you know what gets my asthma flared up in no time? Deep, thick humidity. And we'd had pouring rains the night before which resulted in pea-soup-fogs and high humidity. I hoped I was wrong though. I hoped that this time it wouldn't bother me. I so wanted to do well. Once I got to the race I used my inhaler twice, as insurance against the humid air. The race started on time, and it almost immediately gets into the hills. It's a challenging course. It wasn't long before I was sucking air as my lungs struggled against the thick air. I hit the first mile at 8:20 or so. By mile 2 (16:49), my time was already dropping off and my lungs were crying for air. I realized as person after person passed by that I needed to just settle in and make the best of it, or drop out. I've never dropped out of a race before (heck, I've run 23 miles injured before!). I wasn't going to start. So I backed off the pace and just tried to run my best. The race runs through neighborhoods with gorgeous old houses, so I enjoyed the views and tried to ignore the hills. I backed off my pace enough that my throat no longer felt like it was closing up, and subsequently I stopped making that wheezy embarrassing asthma sound. By mile 3, it felt like I'd been running for hours instead of minutes. My legs felt good. My energy felt decent. Just the breathing issues and painful lungs. An asthmatic never takes breathing easily for granted - because you know how it feels to struggle to pull air. Each mile was even more discouraging as I continued to lose time and continued to watch people pass me by. So frustrating, but at least I was out running. I ended up running the 10K in 53:36. Needless to say, it was not the time I was looking for. But it was good training for me, and it just goes to show I have a lot more work to do to get to where I want to be. Plus, it was not a personal worst, and I gave it a good effort. I signed up for another 10K already - it's quite a few weeks away so I hope to put in solid training until then and perhaps run a better race. Hey-- you pushed through, but played it smart. Good for you. It's frustrating when weather or other life things don't cooperate with Race Schedules!! I am so glad you had your inhaler with you. Do you bring it to every race, or did you grab it when you noticed the humidity? I have asthma and emphysema and use two different kinds of inhalers. One has the most albuterol in it and the other is Xopenex that I sometimes use when I could use a breathing treatment but don't have the time. Humid air does it to me as does really cold air. I have no luck in breathing in a shower - way too humid. I think you won just by finishing. Sorry it wasn't the proper weather for you...hopefully..the next one will be better. I know it isn't the time that you wanted, but I am impressed. I'm so impressed Lisa, that you run despite your asthma. And this was beautifully written. Glad you were able to finish and keep breathing!You are a tough cookie! You have a reason to be proud of yourself, Lisa. Asthma is not within your total control, but you controlled what you could. Great post! That must've been frustrating (and a bit scary, having trouble breathing)! I'm impressed, too, even though it wasn't the time you were hoping for! Okay I am being your mamma like here - girl what were you thinking - you have to be careful! You were blessed you finished the race - asthma is serious - I have it too. I am impressed that you can run at all with asthma! Considering the humidity I wouldn't be too hard on yourself. Anyone who can run a 10k is a rockstar in my book. Gosh, what rotten luck about the humidity!! I know about the asthma, my mom had it most of her life. She had one of those big old fashioned asthma sprays, as we used to call it. This was before there were little inhalers. Every time before she used it, she would have to pour the medicine into the glass part, then squeeze the big bulb to get it to spray. I will never forget the smell, it filled the whole room. Well, I am so glad you didn't push yourself and your breathing got better, there is always a next time! You poor girl-but good for you for finishing! You ARE amazing! You are one determined lady aren't you!? I'm so proud of you, Lisa... Have you always been a runner? My oldest son has/had asthma --and at times, it rears its ugly head... AND--he's 48. Glad to hear you were smart about things. Congrats on finishing! I might have dropped out! 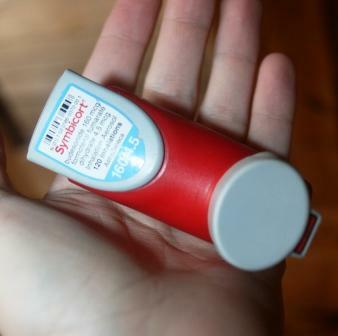 I've had asthma since I was a little kid. I'm also much better. Nowadays the wheezing mostly just kicks in around dogs and sometimes in the cold. You did great! Most of the people would quit, but you were strong enough! :) Bravo! You did just great! You finished the race... I would still be out there trying to finish. I think you're amazing to run with asthma...you poor girl! I've never dropped out of a race either...and 23 miles, injured??!! Holy cow!